If you’ve lived any portion of your life with missing teeth, you’ll appreciate the many benefits provided by dental implants. Dental implants at our Danbury, CT practice are offered as our first choice for tooth replacement, preferred by both dentists and patients alike. Dental implants are the most natural tooth replacement option available in modern dentistry today. They truly provide the most significant health and aesthetic benefits compared to all other replacement solutions. Take the mystery out of dental implants. 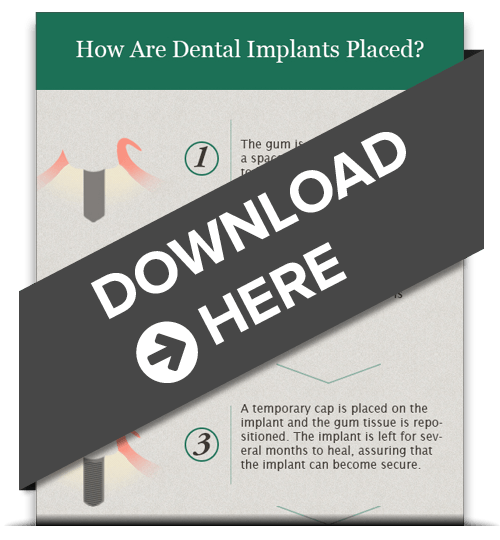 Download our FREE infographic to learn the step-by-step process of how dental implants are placed. A dental implant is technically an artificial tooth “root” that anchors a custom-fabricated crown. The implant is placed directly into the jawbone, and the bone and root will fuse together, creating a sturdy foundation for your new tooth. Once healed, Dr. Gerfen puts a crown on top of the implant. Upon completion, you’ll have a healthy, functional smile that looks and feels as natural as if you’d never had a missing tooth. Our dental implants give Danbury, CT patients with missing teeth a natural-looking method of replacement. To discover if you are a candidate for dental implants, call our office today to schedule your consultation with Dr. Gerfen. Our dental implants will leave you smiling. Schedule your consultation today!